Ladies retreat was a treat! Back in February this year, a bunch of us were lucky enough to travel up to the Tabor Carmelite Retreat centre in Preston, for a peaceful day exploring Mary and Martha, and today Sandra and Donna from the centre came to us to lead another peaceful day, this time exploring the ‘woman by the well’. The story is one I have read many times but I have never really taken the time to understand the Woman at the well from John 4. Today, together with ladies from St Bridget’s, we delved into the scripture and came out feeling enlightened, peaceful, joyful and enpowered. The afternoon saw several of us encounter a labyrinth for the first time. “The Labyrinth is an ancient path. It is a path that is known to have existed for over 4000 years. It is a path that has resonated with people in various countries, cultures, faiths and beliefs throughout the world… Walking prayerfully is very much part of the Christian tradition. 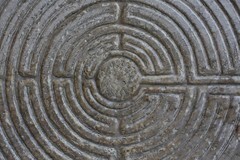 The labyrinth is known to have been embraced by Christians since the fourth century as a support for prayer and contemplation. Can’t wait for the next retreat!